Brining a whole turkey is a process in which the turkey is soaked in a salt and water solution, resulting in juicy, flavorful meat. Sugar and other seasonings are sometimes use to further enhance the flavor. Brining increases the moisture content, ensuring that the turkey will stay moist, even through the long roasting period. The brining process breaks down and extracts some of the proteins from the meat, allowing liquid to be absorbed into the turkey. When the turkey is cooked, the proteins coagulate, preventing the liquid from escaping. When selecting a turkey that is going to be brined, be sure it is not pre-basted or that it is not a kosher turkey. Brining turkey that has been pre-basted is not recommended. Pre-basted and kosher turkeys have been processed with a salt solution to maintain juiciness and if brined, they may end up being too salty. Also, if the turkey is over-brined the result will be meat that is very soggy. Brining a whole turkey is a simple process that results in moist and flavorful meat, which is generally slightly saltier than turkey prepared using other methods. When brining a turkey you will need at least 10 to 12 hours of soaking time so preparation must begin 1 to 2 days before cooking. If you selected a frozen turkey, be sure the turkey is completely thawed before beginning the brining process. A large container is required to accommodate the turkey and the brining solution. A 12 to 16-pound turkey will generally fit in a 20 quart stock pot. A stock pot is not necessary but it is important that the container or pot be made of stainless steel, glass, enamel or other non-corrosive material, otherwise the salt that is used may cause a chemical reaction with the container. To determine the amount of brining solution that will be required, place the turkey in the container and pour measured amounts of cold water over the turkey until it is completely covered with at least an inch to spare. The amount of water added is the amount of brining solution needed. A 16-pound turkey requires approximately 2 gallons of solution. After determining how much solution will be needed, prepare the brining solution. Use the following ratio of salt to water when preparing the brining solution. Kosher salt may also be used and may be preferable since it doesn't contain the additives that are found in table salt. Kosher salt is lighter in weight than table salt so more volume is necessary when using in place of table salt. Regardless of the type that is used, the salt should be dissolved in water before adding to the turkey in the container. 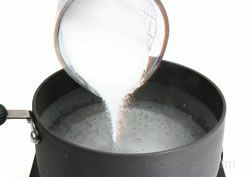 Add the salt to two quarts of the water and heat until boiling or until all the salt is dissolved. Remove from heat and allow to cool. Place the turkey in the container and begin adding cold water. Add enough water so that the turkey is almost covered. Add the cooled salt water to the water in the container. If the turkey is not completely covered, add more cold water until the turkey is completely submerged with at least 1 inch to spare. The container should be covered when placed in the refrigerator or another cold storage area. Other flavorings can be added to the solution including various herbs, spices, or sugar. 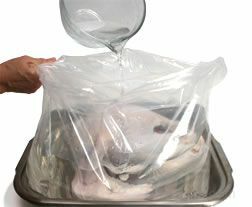 A brining bag can also be used to soak the turkey in the brining solution. Place the turkey in the bag and then add the brining solution. Be sure the turkey is completely submerged in the solution. Remove the excess air by forcing it out the top of the bag, being careful to not allow the brining solution to escape. Seal the bag tightly to prevent the brining solution from leaking out. Be sure the turkey and bag are placed in a pan with sides and double check the seal before storing it in the refrigerator to guard against leakage. When brining a whole turkey with either method (stock pot or brining bag), 10 to 12 hours of soaking time is required. The turkey and brining solution must be refrigerated for the entire soaking time. After the soaking time has elapsed, the turkey is removed from the container and rinsed thoroughly under cold water. Discard the brining solution because it cannot be reused. After the turkey has been thoroughly rinsed, pat it dry with paper towels. Place the turkey breast side up on a roasting rack in a roasting pan and place it back in the refrigerator uncovered overnight to allow the surface to dry thoroughly. This step is not necessary but it will insure a crispy, golden skin on your roasted turkey. The turkey should be allowed to stand at room temperature for 1 to 2 hours before cooking. A brined turkey can be cooked using various methods, such as roasting, grilling, smoking, and deep-frying. A brined turkey will generally cook faster than a turkey that is not brined, so begin checking for proper doneness (with a meat thermometer) when approximately two-thirds to three-fourths of the time required for cooking a similar size turkey that has not been brined, has elapsed. The brining process is much more manageable when brining a turkey that is no larger than 16 pounds. When brining a turkey, it must be stored in the refrigerator or another cold area that will maintain a temperature of 40°F or less but not be below freezing. If you do not have a container large enough or if you do not have room in the refrigerator, there are some alternative methods listed below that could be used. If you do not have room in the refrigerator, certain times of the year an unheated porch or a garage will maintain an acceptable temperature and provide a location to place the container while brining. The area must maintain a temperature of 40°F or less. 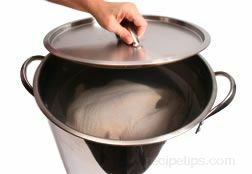 Place the brining container with the turkey and solution in it, in a large cooler and fill the remaining space with ice. Check the temperature in the cooler and make sure a temperature of 40°F or less is maintained. If the ice begins to melt, add more. If you do not have a large enough brining container, the turkey and brining solution can be placed directly in the cooler. Then add sealed plastic bags of ice in the brining solution to maintain a temperature of 40°F or less. Check the temperature often and replace bags of ice when needed. If you do not have a pot large enough to place the turkey in with room to spare at the top, there are alternatives that will work. You can use a clean 5 gallon bucket lined with a large turkey roasting bag. 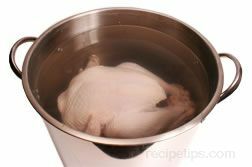 A large ceramic, glass or stainless steel bowl can be used if large enough for the entire turkey to be submerged. Also a large plastic storage container could be used to hold the turkey and brine.